I have often shared my dream of having my own lake front cabin. I’m also kinda blessed to have a rock floor to ceiling fireplace that could be in a cabin. 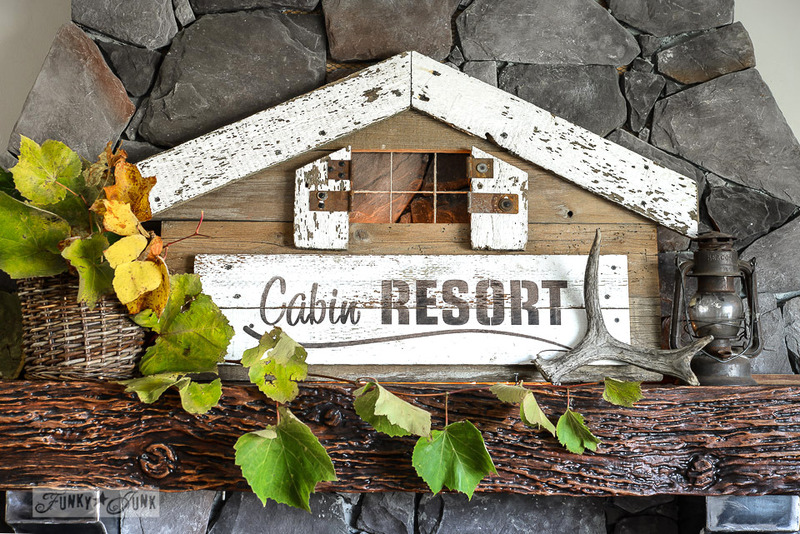 So I decided to celebrate fall… Cabin Resort style this year! 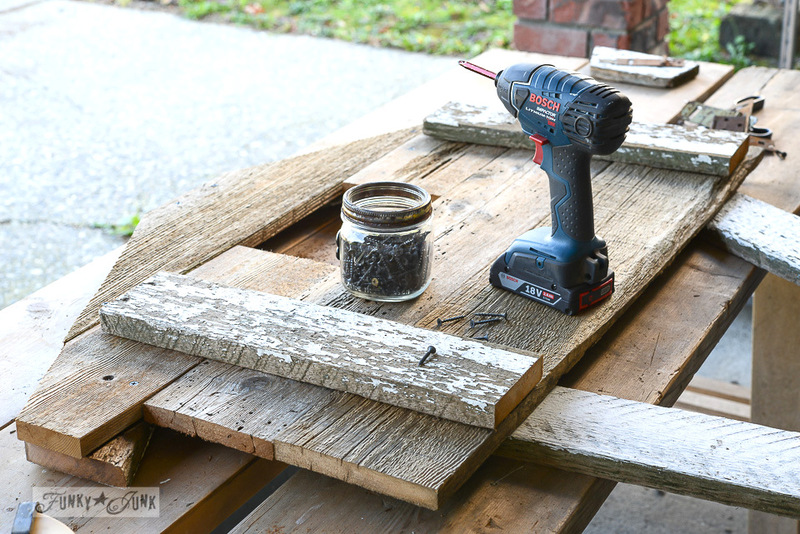 Today I’m teaming up with a TON of other desperately artistic DIY bloggers, sharing all NEW FALL projects today! You will see them at the end of this post and also on Hometalk.com. 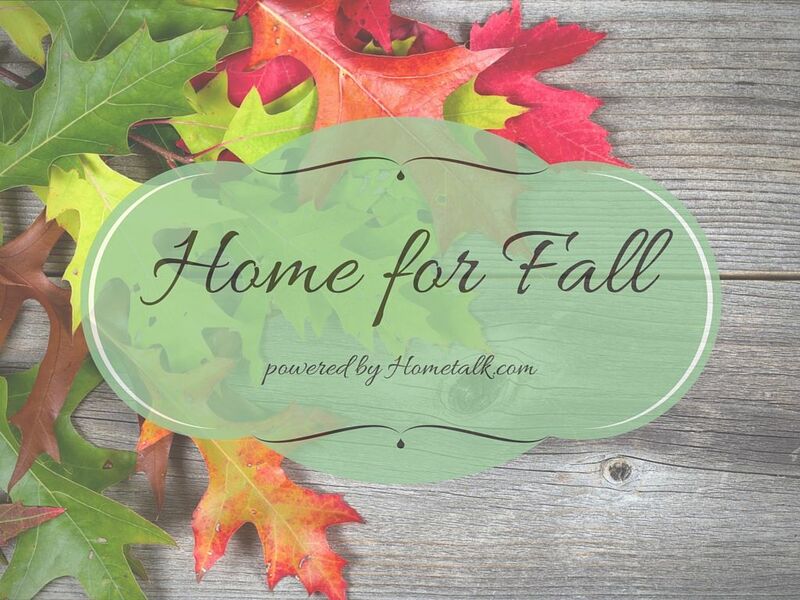 Visit #homeforfall on Hometalk to see all the posts in one easy scroll! 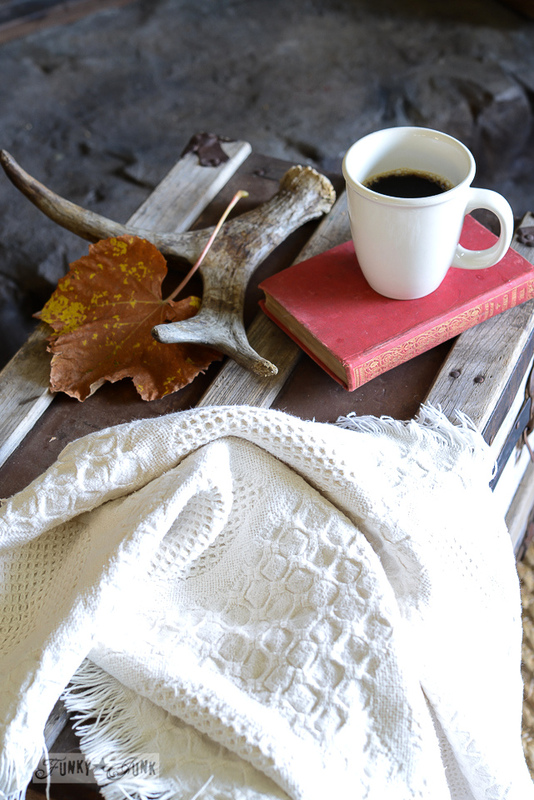 So ready to get your fall on, in a big way today? Here’s mine! And if you get cut off (like I did viewing it), find the whole thing on Katch.me HERE. When I come up with a new project, quite often it starts off fairly simple. My first thought was to create an arrow sign of sorts. 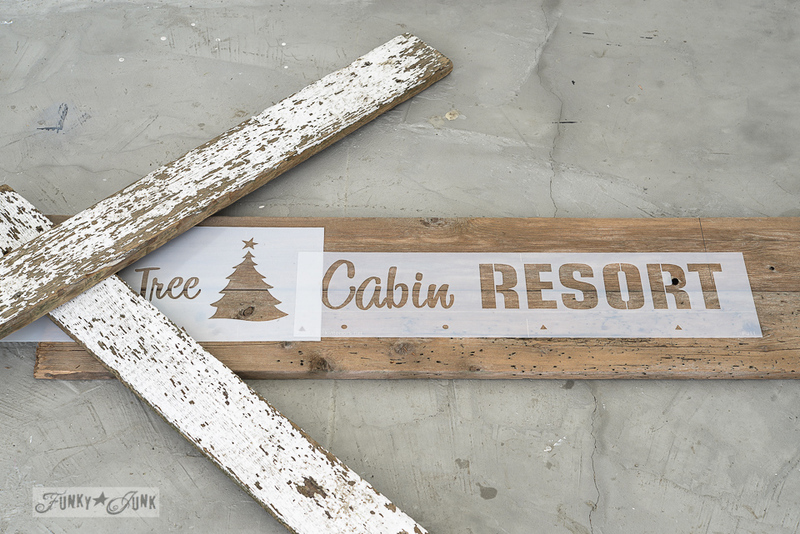 But then I pushed that idea one step further… why not have a cabin shaped cabin sign? Deciding to put it on my fireplace, this shape won. The space above the text was to become a window, with a flickering battery operated candle. Cute, right?! 1. 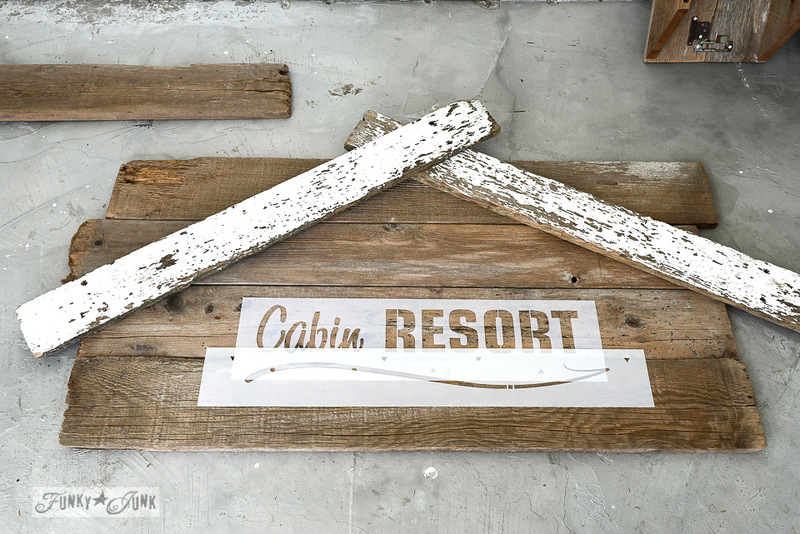 Layer your boards to jive with a house shape of sorts. 2. Trace lines around the roof line, then down the left and right sides, then cut the boards to the shape of your desired cabin. Don’t forget to notch out your window! 3. 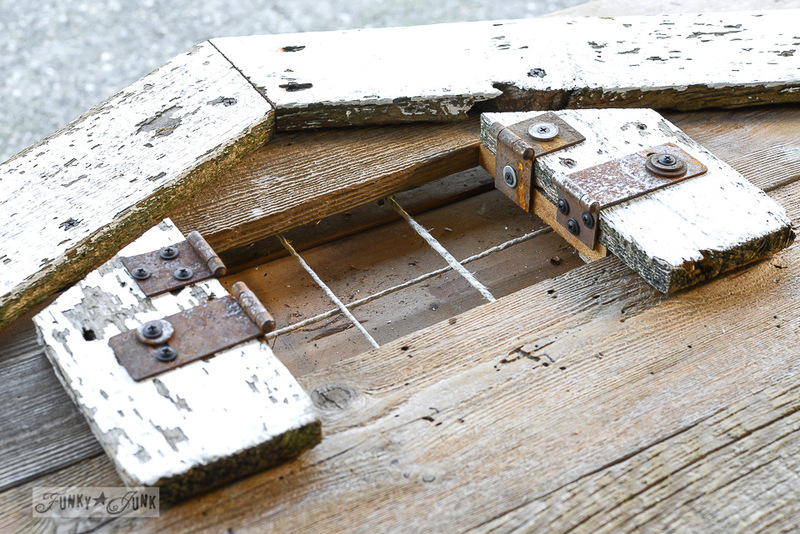 Attach the roof from the front, then flip over and attach the rest with bracing boards from behind, as shown above. 4. 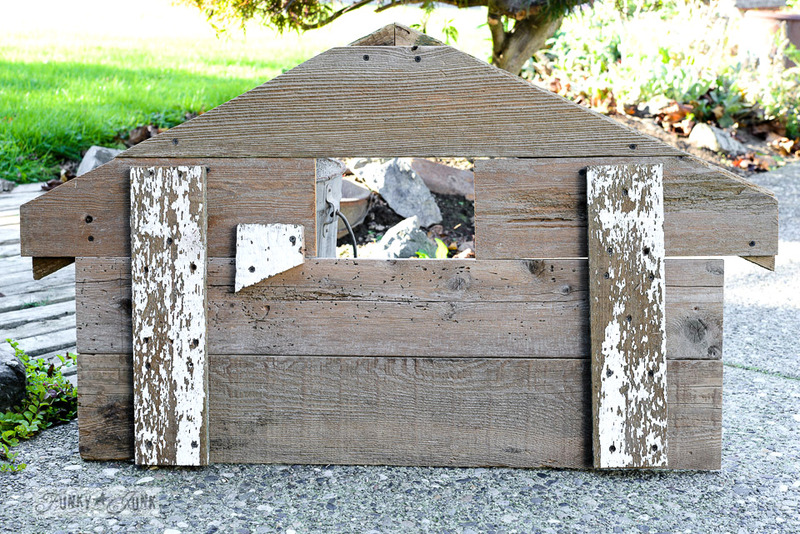 To create shutters, attach little pieces of wood around the windows with funky hinges. 5. 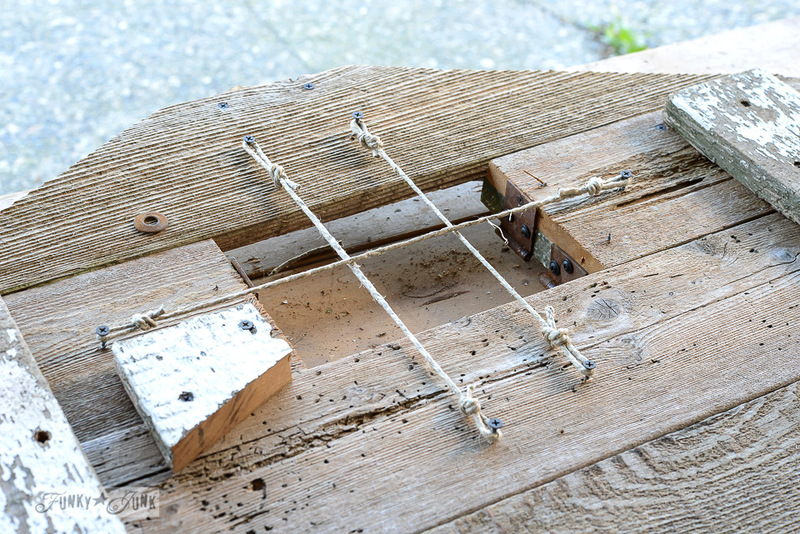 To make the window miter bars, attach string as shown, from the back. 6. 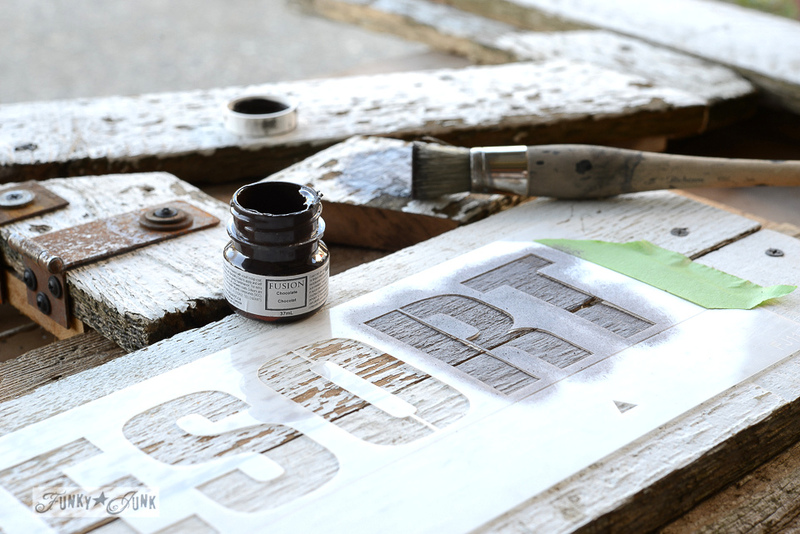 Place a stencil (if you use one) on top of the wood, then go for it! 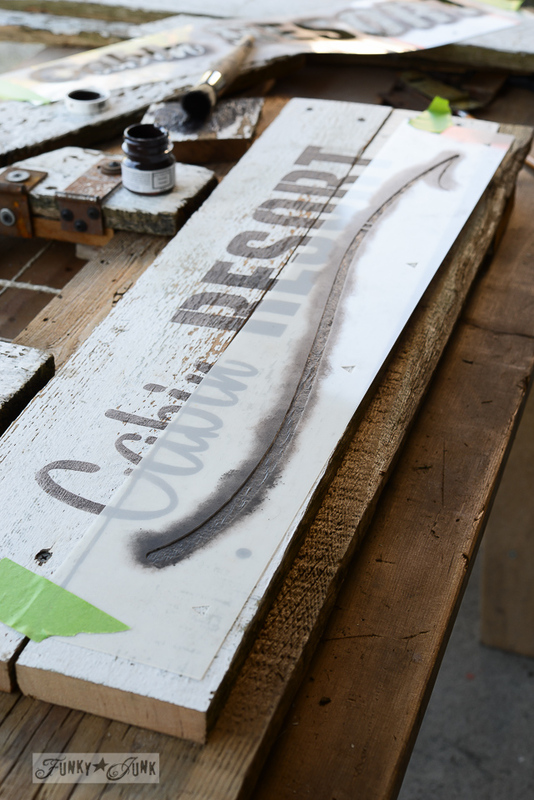 I attached two white boards to the base of the cabin so the lettering would stand out against my dark fireplace. But lettering on the wood would look adorable too. I like to tape the stencil into place, then using your fingers, hold the stencil down as you stencil along, using a VERY dry stencil brush. A tapping up and down motion is my fav way to stencil. 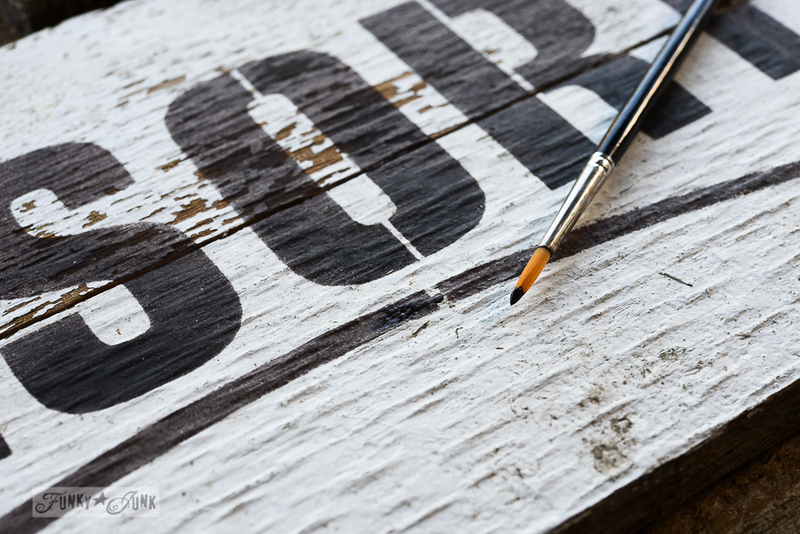 The paint choice was Fusion Mineral Paint’s Chocolate, so the lettering had a warmth to it. Read my review on my love for Fusion HERE. One thin coat was all it needed, thanks to the white background! Perfect, sharp results! Always my goal. A ‘swoosh’ was added for a hand drawn effect. 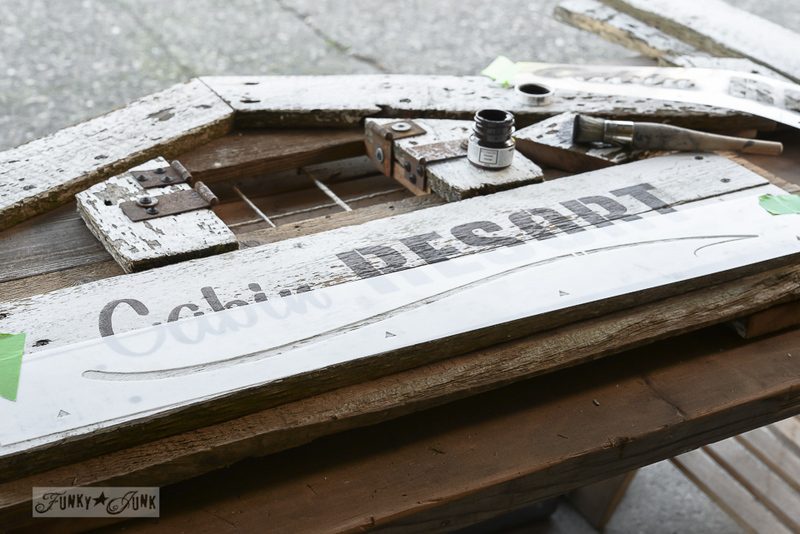 Stencils must be bridged, (small gaps in the images) to maintain stencil sturdiness. I decided to close up the swoosh bridge, by simply hand painting over the bridge. This would look equally cute with a house number! Or just add hooks on it for an entry. Will also work with any season! Can’t wait to play with it for Christmas. And here’s what I really made it for. My fireplace is officially happily decked out in fall. 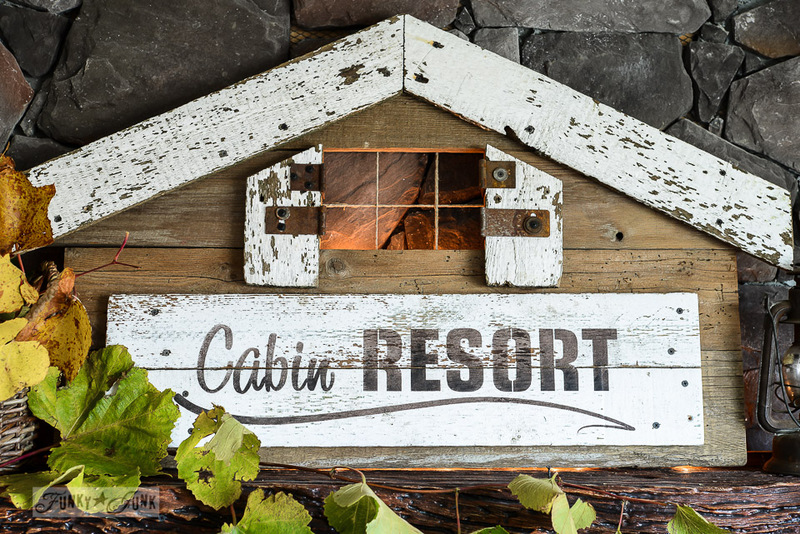 This little cabin sign is also illuminated… can you see the glow through the windows? I actually used white Christmas mini lights plugged in from behind. But battery operated candles would be adorable too if you built a small shelf under the window from behind. For the mini lights, I draped white mini lights on some long screws situated underneath the window. See that tiny strip of wood on the right side? It’s hiding the white extension cord. And I’ve edited out the cord in the room shot. p.s. I want a plug INSIDE the mantel! The glow is adorable at night especially. But equally helpful by day against my darker rock fireplace. This is SO adorable. 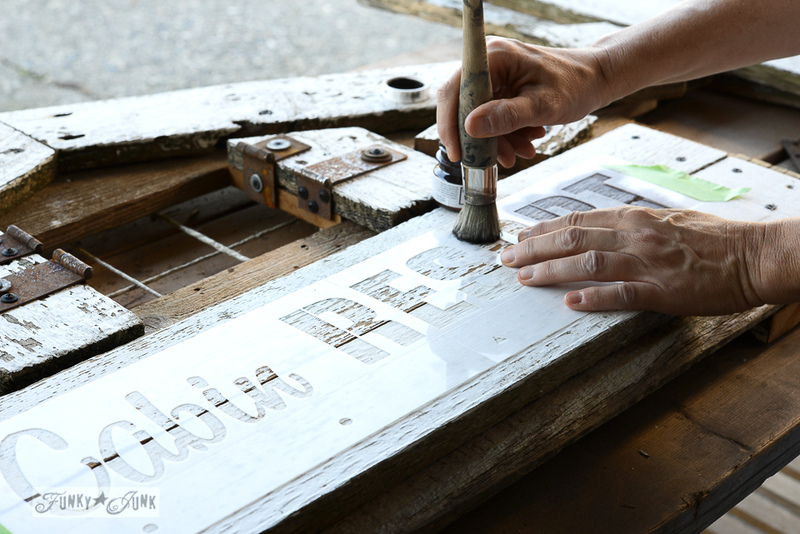 I love the use of reclaimed wood, the stencil is perfect. 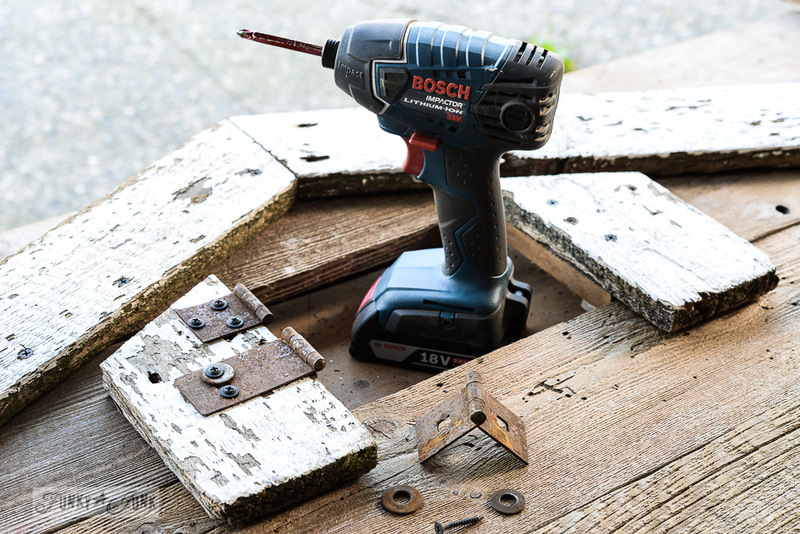 The extra touch of the rusty hardware is SPOT on. Great job and wonderful photos. Also, thanks for putting this all together. Much appreciated. This is the most adorable thing I have seen in a long time! 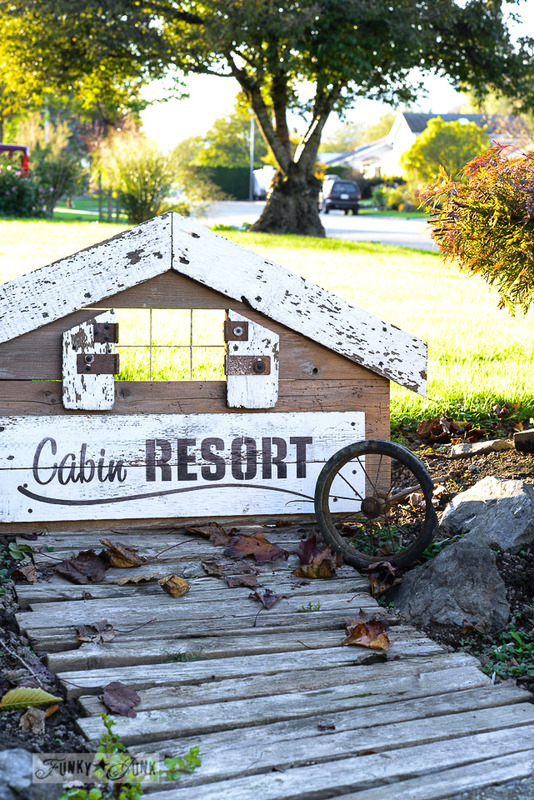 I want a Funky Junk resort cabin of my own! Oh Donna, I do live in a cabin and I love it!!! What a great idea! I’m loving this tour. Thank you for putting this together! Hugs. It’s too darn cute, Donna! Pinned it! oh donna this so reminds me of last year when we stayed at a mountain cabin, and my first time lighting a fireplace (gasp!)! Fabulous little cabin! I really want to have a try at making it. There are several other things I’m very interested in within the links (little bird feeder and blue pumpkins) but I love looking at all the ideas. This has really improved my Monday. This is an awesome project! You’re giving me some neat ideas for this blank wall in my house that I’m planning to tackle soon. 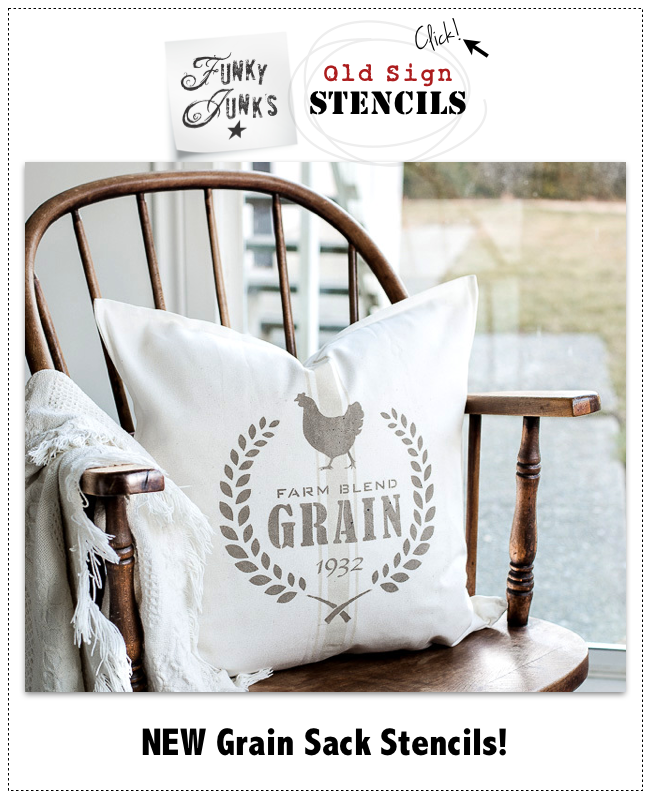 I just ordered the Farmer’s Marker Stencil can hardly wait for it to arrive. I love how creative you are. I have the same kinds of ‘junk’ but don’t have the vision you have. Thank you for all your inspiration. Gorgeous and very unique. Why am I not surprised. Love it! This is absolutely adorable!! So creative and looks fabulous on your mantel! Cant wait to check out everyone’s projects! I love this so much! It is perfect for your mantel! Every sign you create is my new favorite! Love, love, love this one, Donna. The soft glow in the window is the perfect finishing touch! Love this little cabin! So creative. Thank you. I don’t think that there is anything that you can’t do with a little shabby wood, nails and a hammer. LOVE this so much! 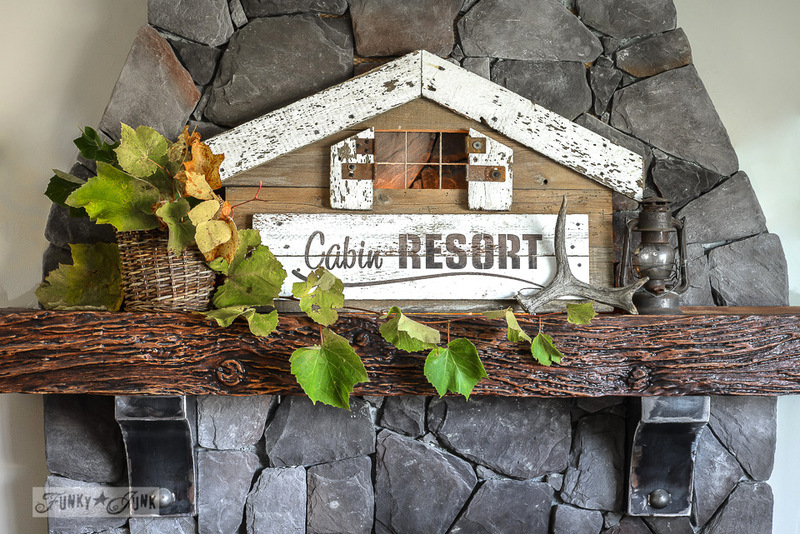 It looks perfect on your beautiful mantle and by the way your home looks so cozy! We will be turning our fire on pretty soon . It’s starting to feel like winter! Thanks so much for organizing this awesome bloghop! 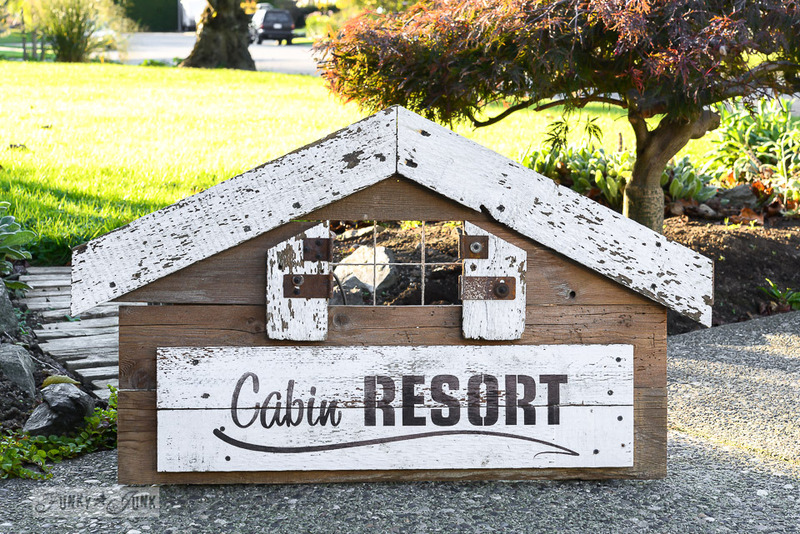 Hi Donna, I’m so excited… lol I guess it’s because of the sneak peek you gave on Periscope of your beyond adorable cabin sign! It turned out so cute, I love the window details, the shutters and jute mullions (miter bars)perfect! thanks so much for organizing this blog hop, I hope it turns into a huge success, it’s been so fun! How Fun! I especially like how you did the “window panes”! This is awesome, Donna! 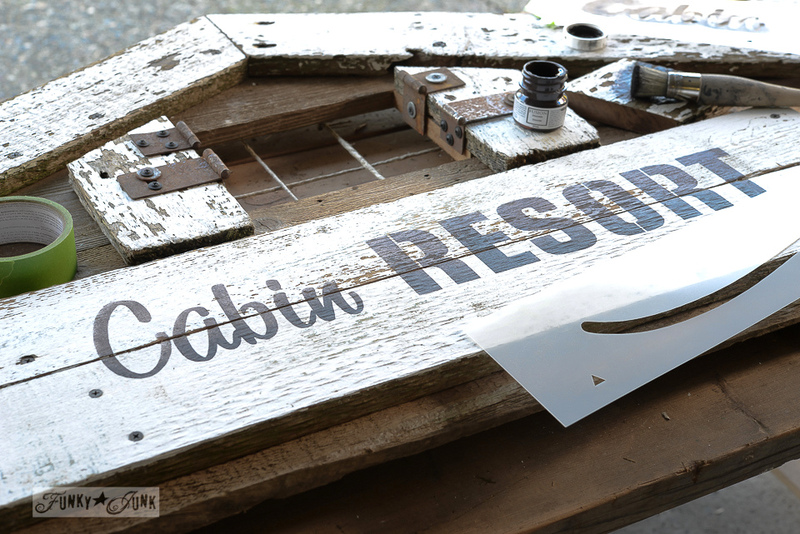 I LOVE the stencil and that cabin you built is amazing. Super sweet, I love it! 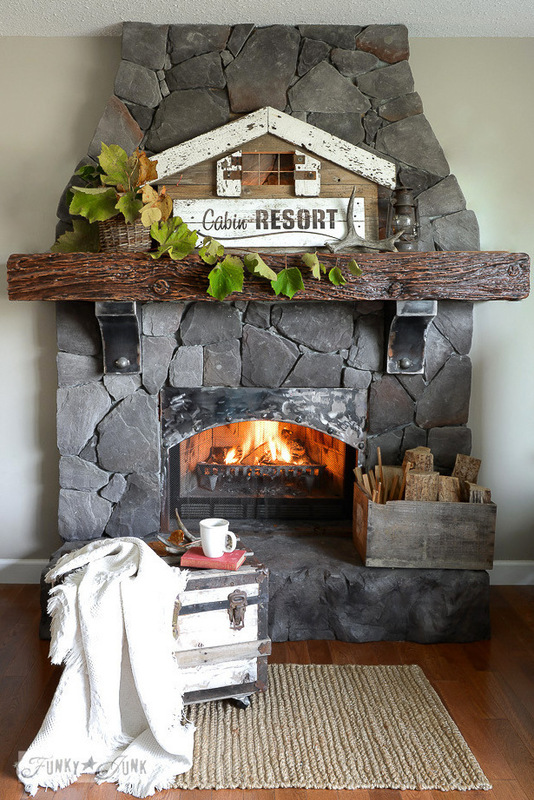 I have a stone fireplace and I think that a little cabin would look perfect on my mantle, as well…in fall or anytime of the year! PS- thanks for organizing the hop…super fun! So cute Donna, love it! I especially love the window with the window with the funky hinged shutters. Very creative. Pinned! OK, that’s so cool it’s not even funny! 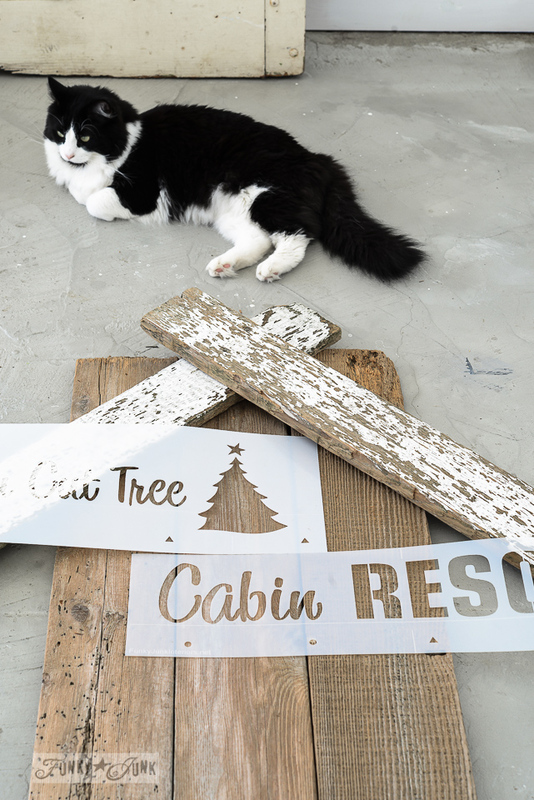 No fair being so darn creative 🙂 I need to get me one of those cabin stencils because that would be perfect for my Christmas decor this year! Your unique style really shows through because although there are countless beautiful cabins (and I mean real ones), your cabin definitely says “Funky Junk” and I’ve a feeling if you actually built a real one, it would be the same thing. The window pane/ shutter feature and the chippy white roof against the dark wood draw me right in. Thank you so much for putting this party together, Donna. 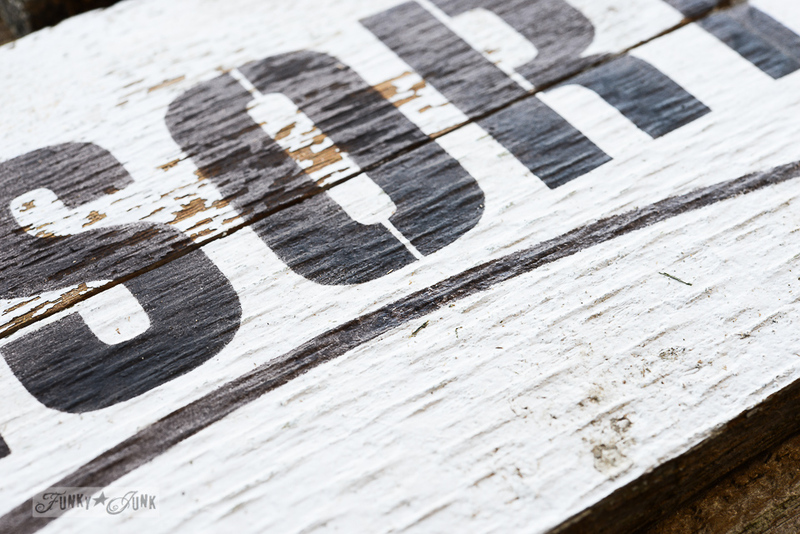 There’s so many projects to be inspired by! Donna this is so cute! I love it! And you did a great job building it 🙂 I think I scheduled almost every photo in this post to my pinning schedule! Oh my goodness… thanks Jill! You never cease to amaze me. I love it. Always do. 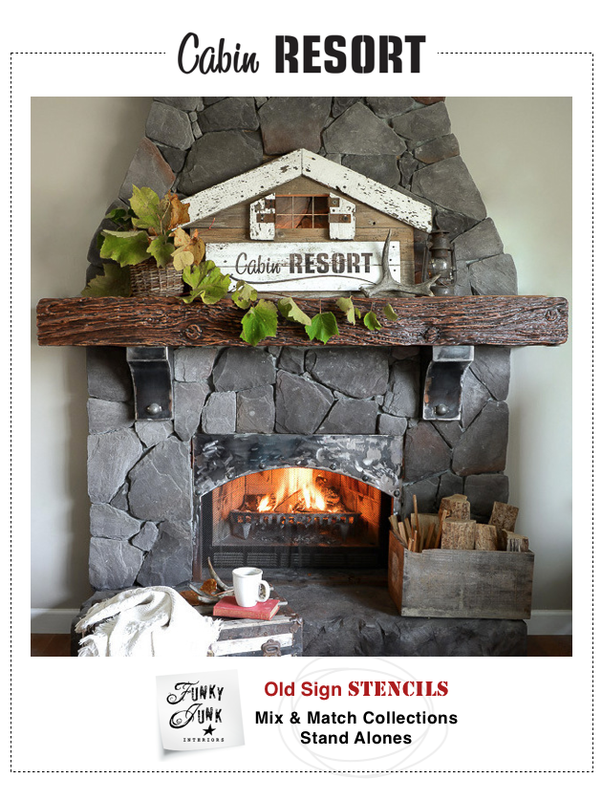 LOVE your fireplace. And this sign is darling! This is beyond amazing!! I love the shutters with the hinges! Rustic perfection!! Oh my goodness!!!! This is incredible! Such a fun and unique idea! 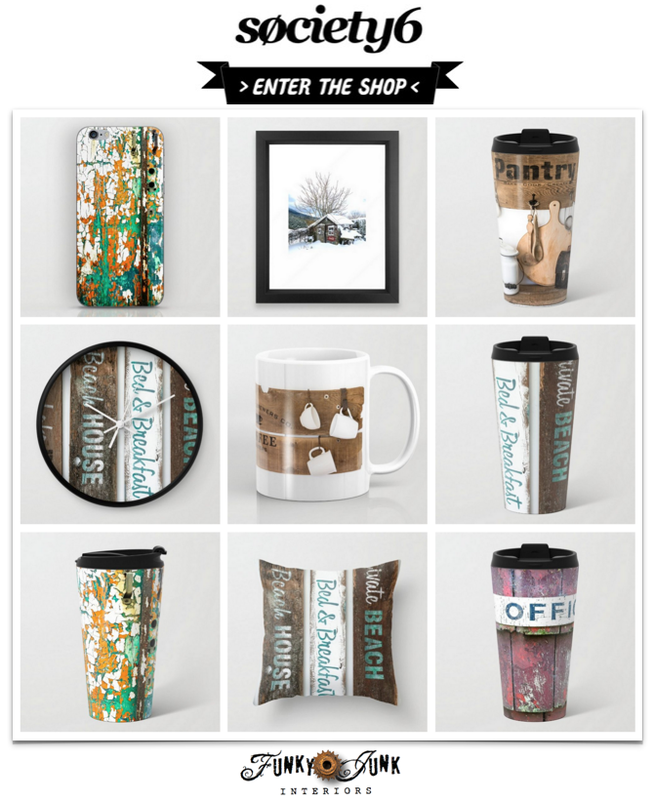 It’s perfect for the whole Fall & Winter seasons! 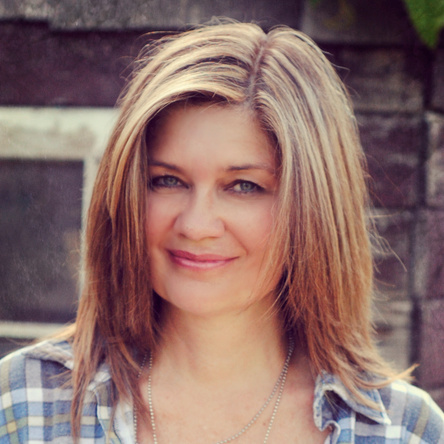 Donna – I love this! I can’t believe to lights up through the window. 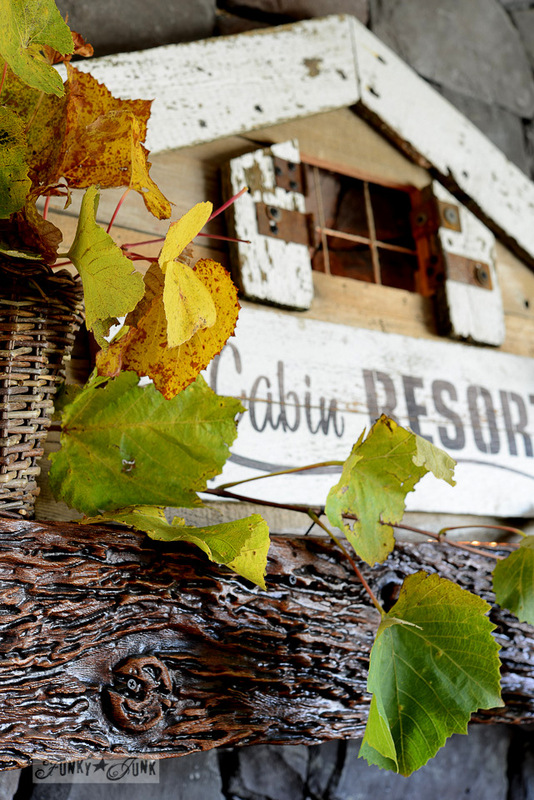 I’m so glad your creative mind went to creating a cabin instead of an arrow – it’s perfect! I absolutely love how sweet this is! I’ve never been able to use a stencil… I guess it’s just not meant to be! I absolutely love your font though… absolutely fabulous! 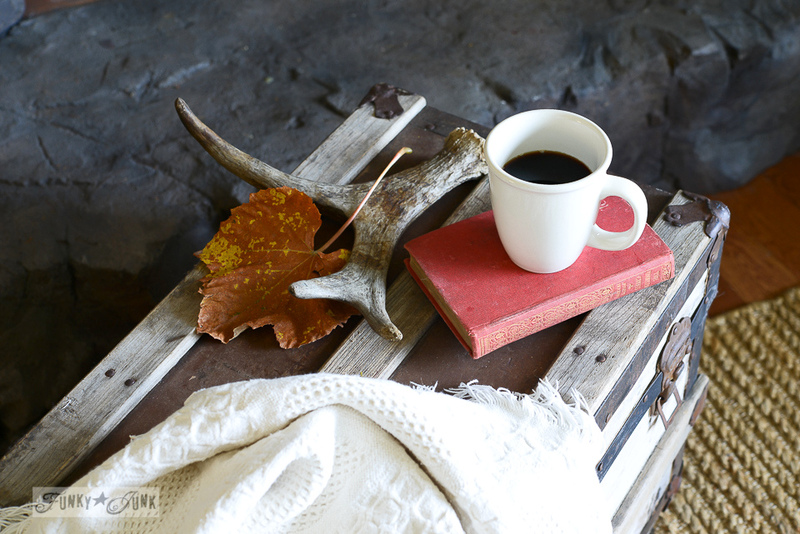 So glad to “meet you” through our little home for fall blog hop! Pinning for future reference! Thanks Betsy! And regarding the stencil, I really struggled at first with them until I learned that a DRY BRUSH was the key. If you can’t do it, use less paint. Thanks for joining the blog hop, it was fabulous!